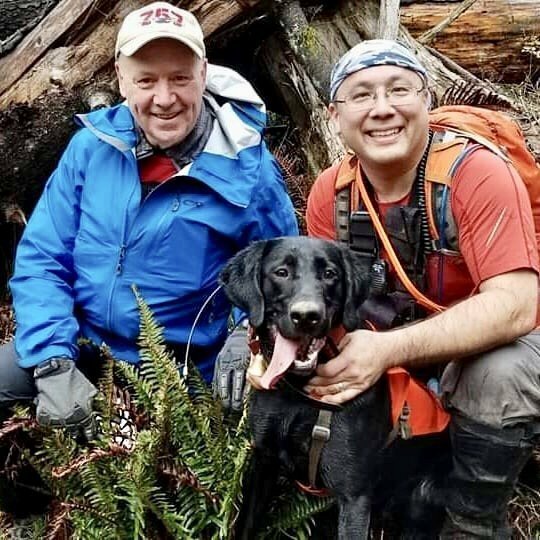 Cascadia Search Dogs is a dedicated group of professional search and rescue volunteers with over a hundred years of search and rescue experience. We are committed to serving the Pacific Northwest region by providing search K9 capabilities for lost or missing persons – ranging from Alzheimer/dementia/autism walkaways, lost children, crimes scene cases, hikers, hunters and mushroom pickers in the wilderness, to natural disasters, avalanches and drownings. We respond in urban, suburban, rural, and wilderness environments 365 days, 24 hours a day. Search K9s are a vital tool for search and rescue missions. A K9’s sense of smell is 10,000 to 100,000 times more sensitive than the human nose and the ability of K9s to move quickly and fluidly through rough terrain make them a uniquely effective tool in challenging or extreme environments. In ideal conditions, search and rescue K9s can scent a lost person from over a half a mile away. Many of our K9s are cross-trained in several disciplines allowing Cascadia Search K9s to be utilized optimally on many different types of search missions. We also have sole purpose K9s trained in one discipline only. Airscenting. K9s trained in this discipline primarily use airborne human scent to locate and lead searchers to a lost subject. They typically work off-leash and are able to search large areas of terrain quickly. Some airscent K9s work scent-discriminating, meaning they search for the scent of a specific person. Trailing. K9s that rely on scent deposited by the subject on the ground, buildings, or foliage as they pass through an area. These K9s are typically scent discriminating and will search for one particular person’s scent. They generally work on-lead. Disaster. K9s that are used to locate victims of catastrophic or mass-casualty events (e.g., earthquakes, landslides, building collapses or fires, explosions, aviation incidents, forest fires). These K9s receive special training to move safely through unstable, hazardous terrain when searching. They rely primarily on airscenting and may be trained to find “live” or “deceased” subjects. Human Remains Detection (HRD). K9s are trained to detect the odor of human decomposition. Depending on the nature of the search, these K9s may work off-lead or on lead. Some HRD K9s – sometimes referred to as “Cadaver” K9s – focus on finding recently deceased bodies while forensically trained HRD K9s go through more specialized training, typically to find trace materials such as blood, tissue, hair and bones. Airscenting and trailing K9s are often cross-trained as cadaver K9s and/or HRD K9s. Within HRD there are other sub-specialties such as water search, historic search and clandestine graves search. Water Search. K9s typically search for drowning victims by boat. When a body is under water, skin particles and gases rise to the surface, so K9s can smell a body even when it is totally immersed. Avalanche. The avalanche K9 is trained to airscent subjects buried under snow. While the priority for avalanche K9s is to find and pinpoint live subjects many can also detect subjects that are deceased. Evidence. K9s search for articles and items that have human scent on them or specific scents of items such as gun shells (gunpowder).